The weather vane serves as the reference point. (Image picked from video below.) Traditional weather vanes have a cockerel figure, which is chicken, which is what Tyson sells. Tyson Food Purpose. Logo animation-ish at the end. The old logo — which I am assuming will remain the same for the Tyson consumer brand — was (and remains) fine; it definitely looks like a grocery store food brand. The yellow stroke looks like it's been very consistently bitten, which, for some reason, is kind of pleasing. The main problem with the old logo was that by taking on the same logo as the consumer brand it eclipsed and hinted at a preference for Tyson over other significant brands like Hillshire Farm or Sara Lee. The new logo is more clearly a parent and corporate brand, representing more equally all of the brands. The monogram features a "T" for Tyson, obviously, and then a chunky arrow lays behind it, creating a subtle crossbar to make an "F" for Foods as a secondary reading. It's an elegant and clever approach and makes for a fine icon. 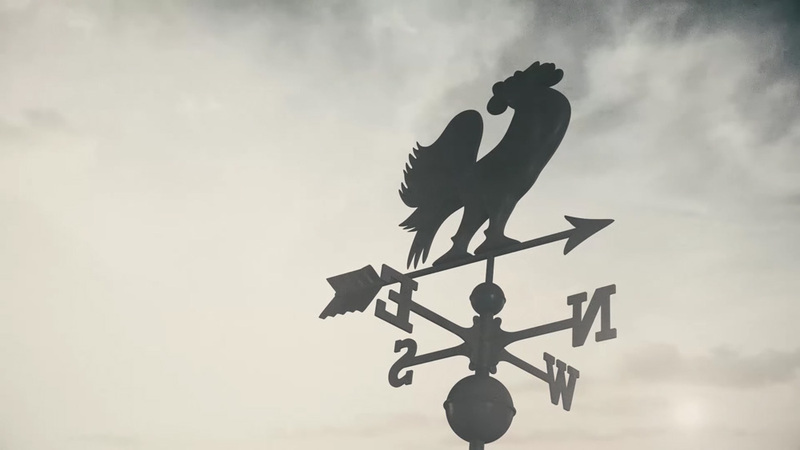 I initially did not get the weather vane connection and my first gut reaction was of a hunter's arrow hunting for chicken (but that's too mean) and my second gut reaction was Steve Martin (but that's too irrelevant). Overall, it's a very nicely executed corporate logo — the arrow matches the aesthetics and thickness of the serifs and that "y" tucks in perfectly under the "T" — while it's nice to see a classic, Clarendon-esque slab serif in use. Thanks to DJ Catrow for the tip. (Est. 1935) \"Tyson Foods, Inc. (NYSE: TSN), with headquarters in Springdale, Arkansas, is one of the world's largest food companies with leading brands such as Tyson®, Jimmy Dean®, Hillshire Farm®, Sara Lee®, Ball Park®, Wright®, Aidells® and State Fair®. It's a recognized market leader in chicken, beef and pork as well as prepared foods, including bacon, breakfast sausage, turkey, lunchmeat, hot dogs, pizza crusts and toppings, tortillas and desserts. The company supplies retail and foodservice customers throughout the United States and approximately 115 countries. Tyson Foods was founded in 1935 by John W. Tyson, whose family has continued to lead the business with his son, Don Tyson, guiding the company for many years and grandson, John H. Tyson, serving as the current chairman of the board of directors. The company currently has approximately 114,000 Team Members employed at more than 400 facilities and offices in the United States and around the world. Through its Core Values, Code of Conduct and Team Member Bill of Rights, Tyson Foods strives to operate with integrity and trust and is committed to creating value for its shareholders, customers and Team Members. The company also strives to be faith-friendly, provide a safe work environment and serve as stewards of the animals, land and environment entrusted to it.\"